A hearty welcome to visitors and newcomers. The Forum shares with all present “information of importance to the African American community in particular and the rest of Charlotte in general.” Come in, have a cup of coffee and make yourself comfortable. Look around. Among those around you on any given day will be wage earners and business owners; civic activists and nonprofit executives; and a variety elected officials of this community—judges and members of Charlotte City Council, the county commission, school board and state legislature. Coffee, regular and decaf, is offered free at all Forums. Nothing is for sale. Donations are accepted toward the cost of buying the coffee and supplies. The Herron Coffee Fund tracks all monies voluntarily left at the coffee pot, the expenses of buying coffee and supplies, and the donations of all excess funds. The Breakfast Page acknowledges those who have agreed to donate breakfast foods on a regular basis. Individuals and companies bringing in food are not paid and do not share in the proceeds from the coffee fund. Raise your hand when you desire to speak and you will be called upon in the order acknowledged. A variety of input is greatly valued so an attempt will be made to hear from those who have yet to speak before acknowledging those who desire to speak again. In that this is a forum, a public meeting place for open discussion, it is expected that all attendees will dialogue (the understanding of self and others) in lieu of debating (the successful argument of one’s position over that of others). It is asked that your questions be succinct and precise so that others may also have an opportunity to participate in the topic of the day. It is further asked that attendees engage in non-threatening, non-name-calling, non-finger-pointing dialogue and conduct themselves in a manner that reflects the very best the Tuesday Morning Breakfast Forum has to offer. While it is evident the Forum attracts some of Charlotte’s brightest and most eloquent, the Tuesday Morning Breakfast Forum apologizes for not having ample time for such intellectuals to showcase their talents at length and reserve the right to remind those who may forget. The Forum is a public meeting held in a public place, and is open to all. Members of the media are welcome, and television crews are accommodated as best as the space will allow. Forum meetings have been videotaped since 2011. Those videos are available in this website’s Archive and are stored at YouTube. In October 2015 the Forum began experimenting with live streaming of the meetings to open the content of the discussion to many people whose commitments make it impossible to attend an 8:30 a.m. meeting. Live streams become a videotape of the meeting, which is also stored at YouTube and may be viewed later. On Tuesday mornings when equipment and Internet and the stars are all aligned and a live stream begins, a clickable link like the image at right is inserted on the top left corner of the front of this website, then removed sometime after the meeting. Forum sessions are livestreamed to the Forum website and YouTube, and the video is archived at YouTube. Cameras are focused on presenters. During the Q&A, questioners’ voices are recorded, but generally not their images. During Announcements, video is taken for the aid of creating the written announcements. Public officials’ announcements may be posted. But private citizens’ announcements are not livestreamed, and their images are generally not posted. 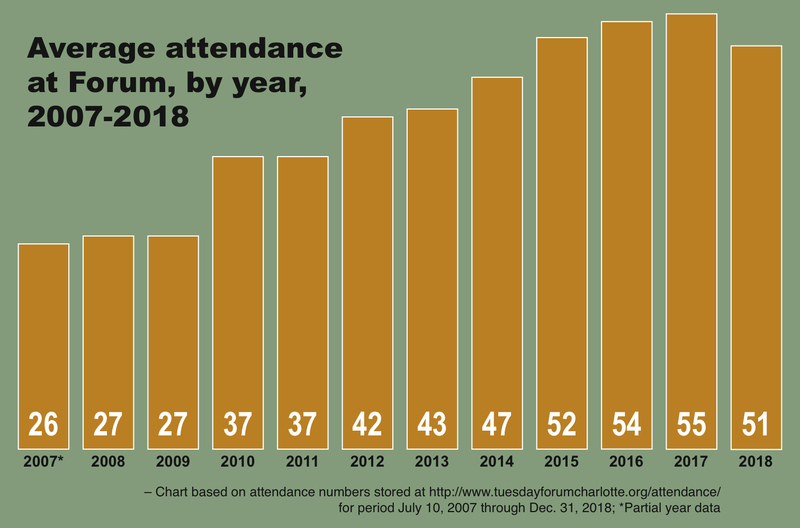 Since July 2007, the Forum has kept track of attendance, initially for the Mecklenburg Parks & Recreation Department. Those records are here. Co-founder Sarah Stevenson continues to help lead the Forum. Photo by Leonard R. Jones. “The declining interest in local and state affairs, reflected in low voter turnout and reduced membership in civic groups, is disappointing…. Fortunately, Sarah Stevenson is among those who have bucked those trends in Charlotte for 25 years — for which she deserves praise. “In 1980, she and now-deceased Mecklenburg County Commissioners Bob Walton and Phillip Berry started the Tuesday Morning Breakfast Forum at the old YWCA on Trade Street. It was an outgrowth of the Black Political Caucus…. Now meeting at a recreation center next to West Charlotte High School, it’s a rare sounding board for Charlotte’s African-American community to communicate with the mostly white, southeast Charlotte leadership — and vice versa. “Speakers and questions are timed precisely to avoid excessive rants. That’s important because the cadre of regular attendees, including Richard McElrath, the Rev. Thomas Moore and Gyasi Foluke, do not lack for strong opinions about inequities in Charlotte. “We want to inform people and let them air their concerns and their complaints to the right folks,” says Stevenson, who moderates the meetings. Much of the group’s longevity clearly stems from widespread respect for Stevenson’s gracious yet firm style…. Longtime Forum participant Jackie Edwards Walton says she attended the Forum for the first time in January of 1978, rather than the 1980 referred to in Mildenberg’s story above. The Charlotte Observer report below makes two points: The Forum was called into being by a letter signed by Phil Berry, Sarah Stevenson and the Rev. George Battle (The article does not mention the date); and the Forum’s firrst meeting was held at the YWCA, 418 E. Trade St., on Dec. 16, 1980. Longtime participant Ken Koontz rose on July 26, 2016 to explain the Forum’s role. 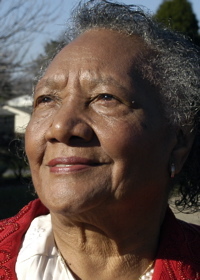 Longtime Forum participant Martha Alexander served in the N.C. House from 1993 to 2013. Click the video to start it. Sara Spencer served on Charlotte City Council in the 1990s Click the video to start it. “Someone once said that Sarah Stevenson knows how to conduct while allowing people to keep their dignity. As a young woman in my twenties working with her at the Charlotte Mecklenburg Youth Council, I began to understand. I grew to understand she was the type of leader that would put forth an extra effort to praise, encourage and motivate others first. “I also discovered that Sarah is always thinking ahead, and that quality is what led to the Tuesday Morning Breakfast Forum. Back in 1978, Charlotte was taking its first steps toward becoming a world-class city. It had already become known as the “Can-Do City,” and African Americans needed a place to discuss issues of the time. “This was indeed an interesting time. Ken Harris, a Republican, was the mayor who would soon be replaced by Eddie Knox, a Democrat, in the 1979 election. The Governorship of the State of North Carolina was held by Jim Hunt, a Democrat who understood and tried to address the needs of everyday people. Through business interactions, sports exchanges, government contracts, educational trips, expanded development in the arts, advances in integrating our public school system, and cultivating relationships with sister cities around the world, Charlotte had become a classroom for national and global understanding. “I spoke with Sarah about the apathy that was developing during those early years due to a lack of communication. She said that our people were largely operating in a vacuum and needed an opportunity to discuss issues with elected officials and appointed officials. We also needed more black elected officials. Conversely, black elected officials really needed the Tuesday Morning Breakfast Forum in order to be able to meet with a diverse group of people. Most of them had been elected to the City Council in 1977 and needed a way to reach the public…. 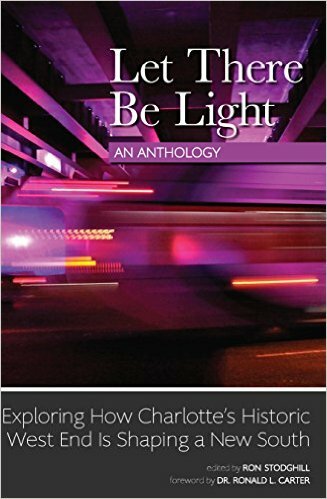 “Let There Be Light” does not appear to be sold as a paperback or hardback book. It is available as a Kindle e-book from Amazon and as a Nook book from Barnes & Noble. May God bless us with discomfort at easy answers, half truths, and superficial relationships, so that we may live deep within our hearts. Amen. May God bless us with anger at injustice, oppression, and exploitation of people, so that we may work for justice, freedom and peace. Amen. May God bless us with tears to shed for those who suffer from pain, rejection, starvation and war, so that we may reach out our hands to comfort them and to turn their pain into joy. Amen. May God bless us with enough foolishness to believe that we can make a difference in this world, so that we can do what others claim cannot be done. Amen.